Burger10 is turning 2 years old on Thursday 19th of May, 2016 and to celebrate this milestone, all our delicious burgers will be reduced to $8! That’s right – all of our ten mouth-watering burgers can be sampled for as little as $8 all day! 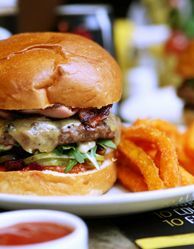 Our delicious menu offers 10 signature burgers, each celebrating the distinctive flavours of 10 countries. Come and take a culinary journey around the world; from the no fuss American style burger with a succulent grass fed beef pattie, to the tantalising Chinese pork and prawn burger, served on a steamed bun and the flavourful Greek lamb burger, seasoned with oregano and mint and accompanied with refreshing cucumber tzatziki. All Burger10 gourmet burgers are made with 100% Australian produce and grilled to perfection. You can complete your meal with a side of sweet potato or potato chips, a seasonal salad and even rissoles! There’s even baked cheesecake if you are after something sweet! The Burger10 $8 offer is valid on Thursday 19th of May, 2016 only and applies to dine in and takeaway customers only. Come down to the Glebe burger bar from 11.30am to 11pm to take advantage of this very special offer.